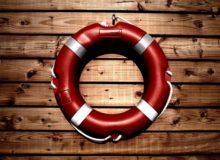 The series of free online lessons “Read and listen in Russian” is designed for reading and listening practice and intended mostly for upper-intermediate and advanced Russian learners. These lessons include the excerpts of works of Russian literature, interesting stories about Russia, Russian cities, Russian traditions and customs. Every lesson comes with a translation and an audio file recorded at a normal conversational speed. This is a new lesson of the series “Read and listen in Russian” designed for reading and listening pratice, and today we offer you a collection of funny and serious survival tips for foreigners in Russia which we collected all over the internet. We hope that this information, firstly, will make you smile, and secondly, will help you with your trip to Russia or with your Russian friends or colleagues. Tell us your Russian experience in the comment section and will include your advises in the second part of this lesson. The lesson comes with an audio file recoreded at a normal conversational speed. 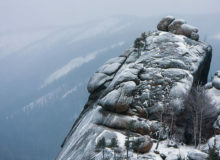 In today’s series “Read and listen in Russian” designed for your Russian reading and listening practice we’d like to tell you about a wondeful place – a National Nature Reserve Krasnoyarsk Stolby. “Stolby” is the plural of “stolb”, the Russian for “pillar”. The regular Stolby goers call themselves “stolbists”, and the public activity as a whole is called “stolbism”. It is an exceptional activity with a long history of over 150 years and old customs recorded in a special folklore. You’ll see some gorgeous photos and learn about this Nature Reserve and how to get there (in case one day you find yourself around that area). Winter is here and it is time to think about the warm clothes. What about Russian ‘valenkee’ (ва́ленки)? 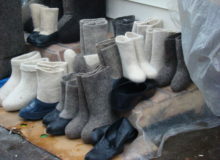 In today’s lesson of the “Read and listen in Russian” series we will tell you how Russian felt boots are made. And not only tell, but also show – you will see the entire production process “from A to Z” in pictures. 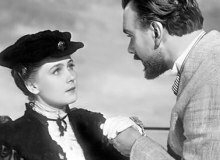 Today in the series “Read and listen in Russian” we continue to get familiar with the Russian literature and read the last part of Anton Chekhov’s story ‘The Lady with the Dog‘. We hope you enjoyed all the previous parts and will find this last one even more enjoyable. The full transcript, complete translation in English and an audio recording are available for free. This is a new lessons of the series “Read and listen in Russian” and today we continue to introduce you to the masterpieces of the Russian literature. 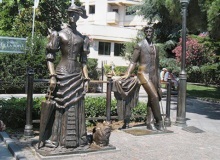 Yalta, where the story “The Lady with the dog” takes place, was a fashionable resort for the Russian aristocracy and gentry in the 19th century. Anton Chekhov in 1898 bought a house (the White Dacha) here, where he lived till 1902. It is now his museum. On the embankment of Lenin in Yalta a sculptural composition based on the story The Lady with the the Dog is set. 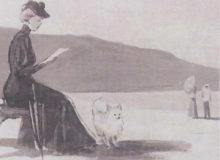 This is the second part of the third chapter of the story ‘The Lady with the Dog‘. 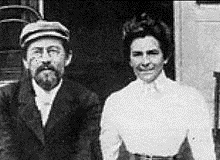 Always modest, Chekhov could hardly have imagined the extent of his posthumous reputation. 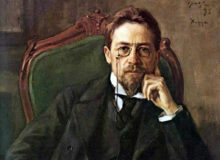 The ovations for The Cherry Orchard in the year of his death showed him how high he had risen in the affection of the Russian public – by then he was second in literary celebrity only to Tolstoy, who outlived him by six years – but after his death, Chekhov’s fame soon spread further afield. Today in the series “Read and listen in Russian” we are reading the second chapter of his short story “The Lady with the Dog”. We divided this chapter into two parts. 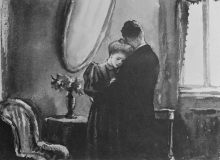 Today, in our category “Read and listen in Russian”, we offer you a story by Anton Chekhov “The Lady with the Dog” what was firstly published in 1899 and consists of 4 chapters. This is the first of them.